Historically, there have always been significant barriers to become an "author". 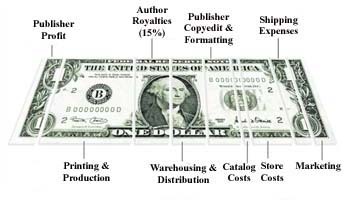 Anyone lucky enough to be chosen by a publisher would earn great respect of his peers because everyone knows that it costs a fortune to make a book and only the very best are chosen to write books. This has changed. In this new age of Internet blogging, millions of people have been given an unprecedented opportunity to publish their technical research. They have a taste for authoring, and they want to move-up to the next step, a "real" book, the kind that you find in libraries and bookstores. Let's take a look at how prospective technical authors can choose a topic that the major publishers will accept. Before we start, let's review the economic changes over the past 40 years. Back before the advent of the Internet, IT professionals relied solely on academic journals, trade magazine, conferences and vendor documentation. In 1984 there was no need for computer-related books and in a quarter-million book bookstores you might find only a tiny handful of computer books (usually JCL or Cobol). Back in 1984, books were very expensive to produce. Computers were generally not used, and the centuries-old technique of manual typesetting was used, the tedious and expensive process of choosing every letter of the book (from bins of letters). Each page was constructed as a 20 lb. lead slab, which would be placed, one-at-a-time into the printer. I suspect that the term "heavy reading" originates from the fact that a 1,200 page book would have over a ton of typesetting slabs stored in the warehouse. Major publishers had hundreds of tons of these trays of lead slugs, as they were very reluctant to "breakdown" a typesetting project that cost many thousands of dollars, just in-case they had to re-print the book. Let's see how the time have changed in the past 20 years. A single mistake can put a publisher out of business, and publishers today require a cost-benefit analysis, just like any other business decision. Let's take a closer look. A unique topic - A technical publisher anticipates the needs of the community and has a topic that will be super-hot. The ideal book will have no direct competitors. A unique approach - Successful books can be published if they take a fresh look at a common problem. The O'Reilly "hacks" series of a great example. A known author - A potential author must be a subject-matter expert on the technology. Special qualifications (MBA, PhD, Microsoft MVP, Oracle ACE, Oracle Certified Master), all lend credibility and help make an author more appealing to the publisher. Also, people like to buy technical books from people they have read before, and popular bloggers will have a built-in fan base for their first book. The most important way to justify your topic is with a competitive analysis, and you must justify that the topic is popular enough to show velocity in an overcrowded computer book market! So, how do we track “real” sales? I use Amazon, snap-scan (www.snap-scan.com) The Amazon Sales Rank (ASR) is the only “free” way to judge the true sales velocity for your book. See Amazon Sales Rank Tracking for details. Also see this note on author self-promotion for your area of expertise.